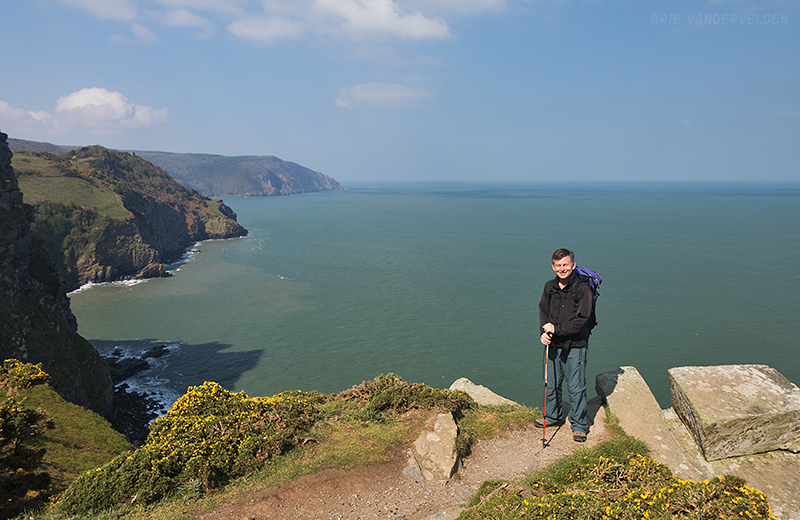 This is part two of our north Devon coastal hike. We started our hike in Blue Anchor Bay, Somerset. Read part one of our hike here. 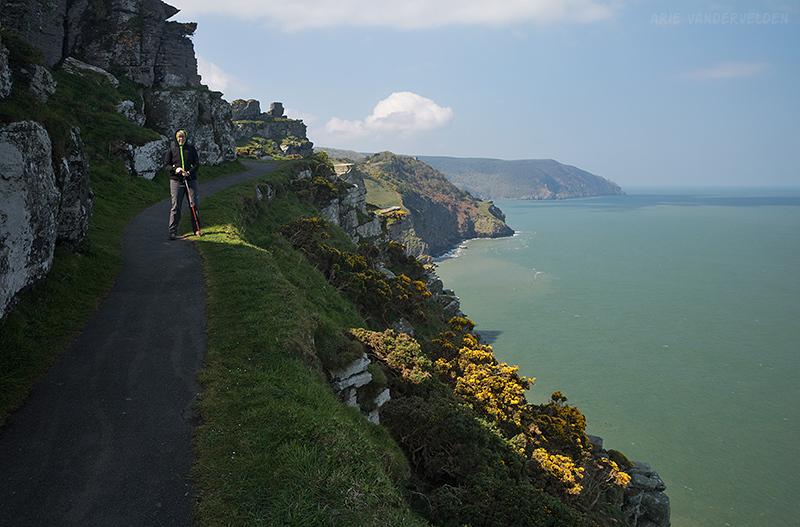 We started out in Lynton, the town just above Lynmouth. 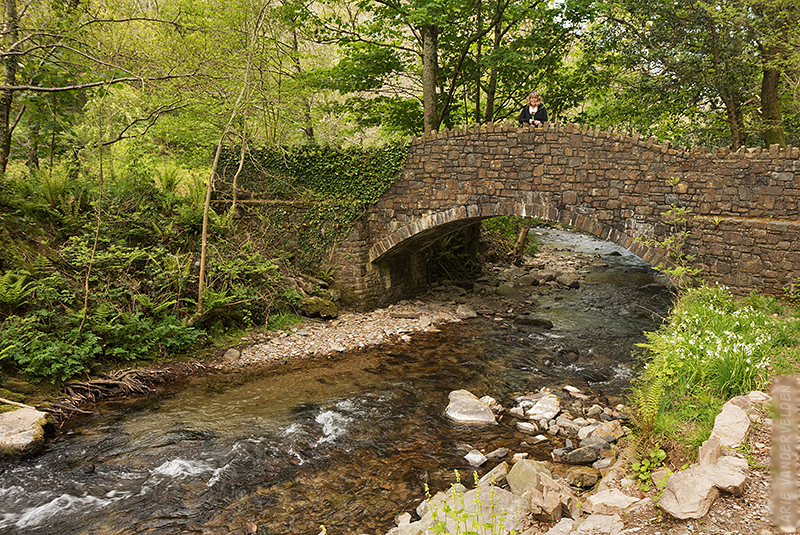 Lynton is set in a hanging valley above Lynmouth. 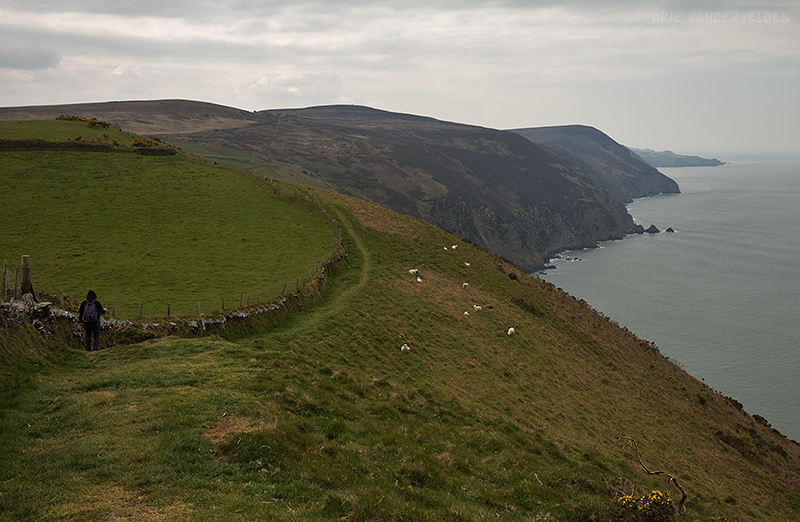 Separating Lynton from the sea is a hill, and the trail wound around to the seaward side of this hill. Steep grassy slopes soon gave way to ledges. 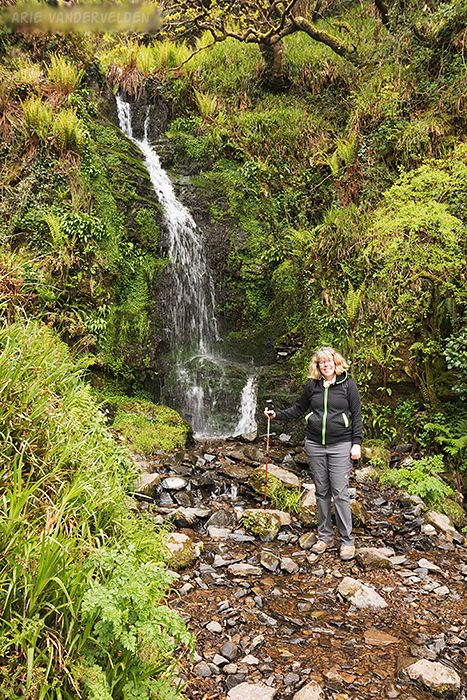 The terrain here was spectacular, and this section was one of the most scenic along this stretch of coastline. 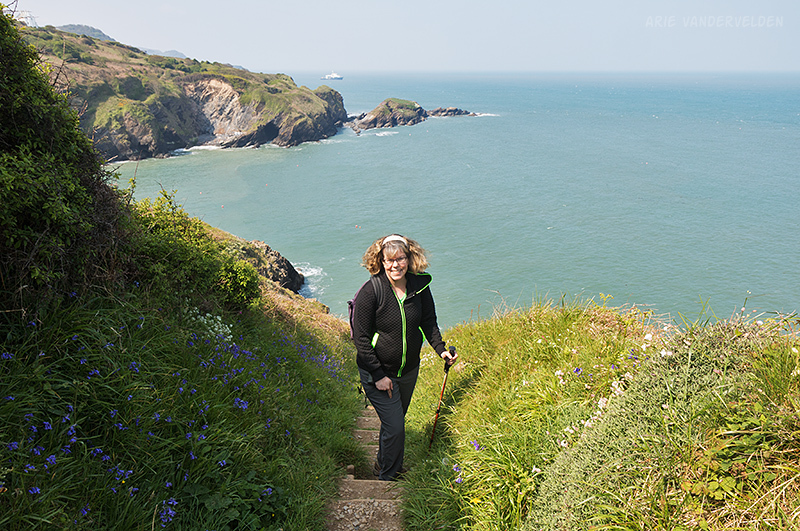 Hiking along the coastal cliffs. Although the trail was paved and as wide as two sidewalks, the dropoff towards the sea was tremendous in places. The weather was wonderful. It was a cool, crisp morning. A few clouds drifted by, casting shadows on the sea. These cliffs are north-facing, and we were in the shade. The trail followed a series of ledges. On top of a promontory. 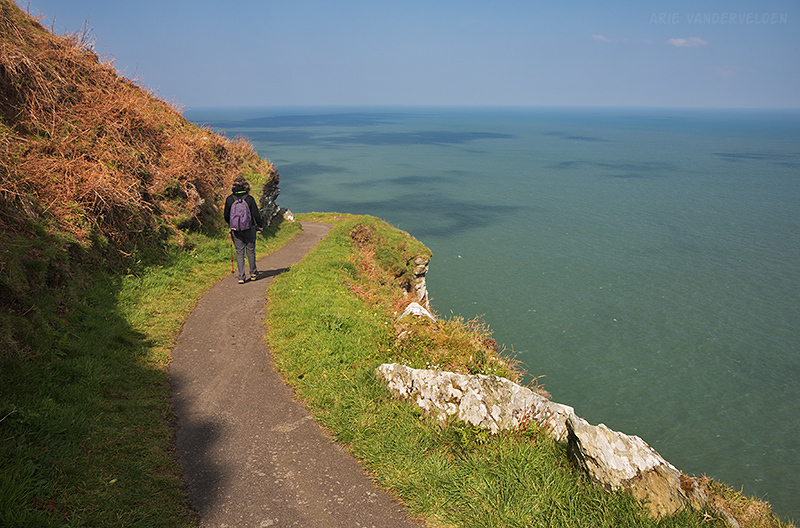 While hiking this stretch of coastline I was looking for seabirds nesting on the ledges. It was probably too early in the season, and I did not see any gannets or other birds like that. 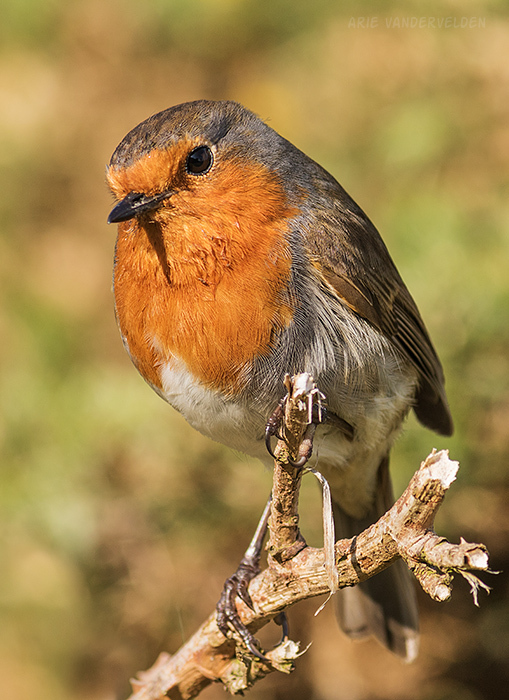 But we came across a little robin, sitting on a twig, looking at us with curiosity. He wasn’t shy at all, and I had time to mount the telephoto lens on my camera so I could shoot this little guy’s portrait. Suddenly the spectacular section of trail came to an end. The trail headed inland, on a country road through a valley. The area seemed to be a Christian estate. At one point we passed an abbey, and there was an outdoor camp for youth. The road led down to a creek at Lee Bay. 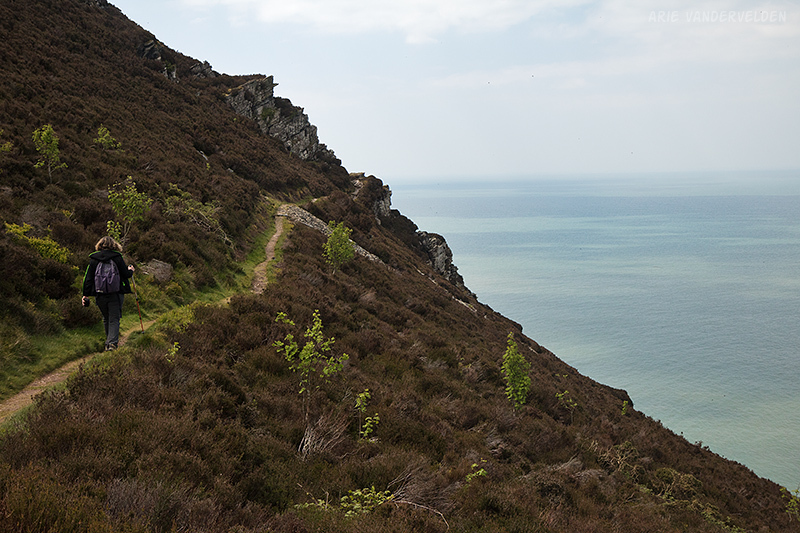 Past Lee Bay the road climbed up into the forest, skirting high above some tall and steep sea cliffs. Past this area was Woody Bay, where the trail followed some switchbacks on a road going down. 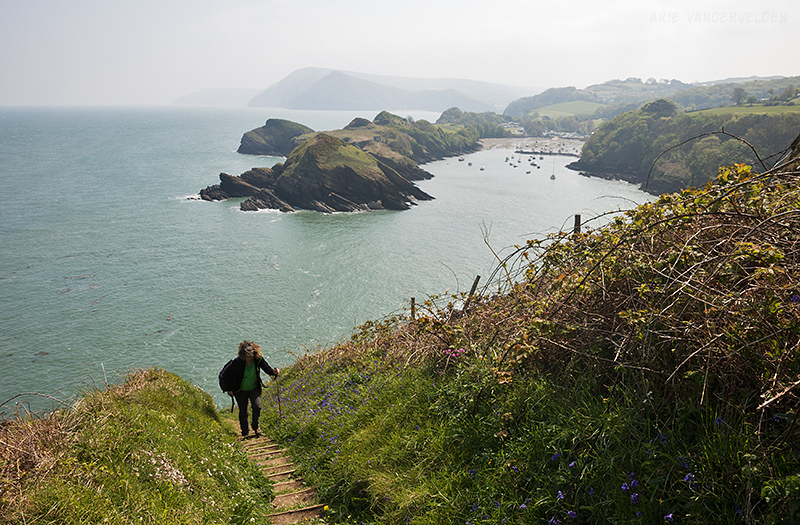 The trail then ascended again and came around a hill where there were views of the sea. There was a bench, and we stopped for tea and a snack. We pondered the way we had come. Ahead we passed Hollow Brook. Small waterfall at Hollow Brook. Just ahead the trail broke out of the trees and traversed some wide-open sideslopes. 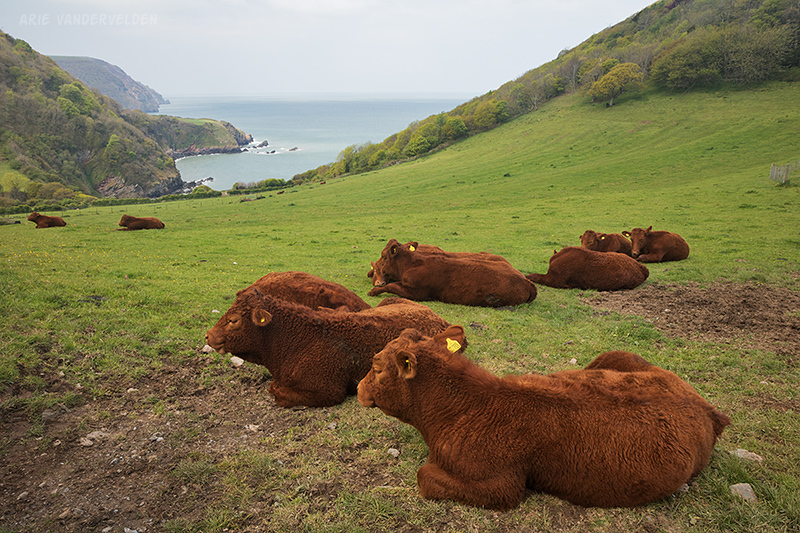 We got some great views up and down the coast. 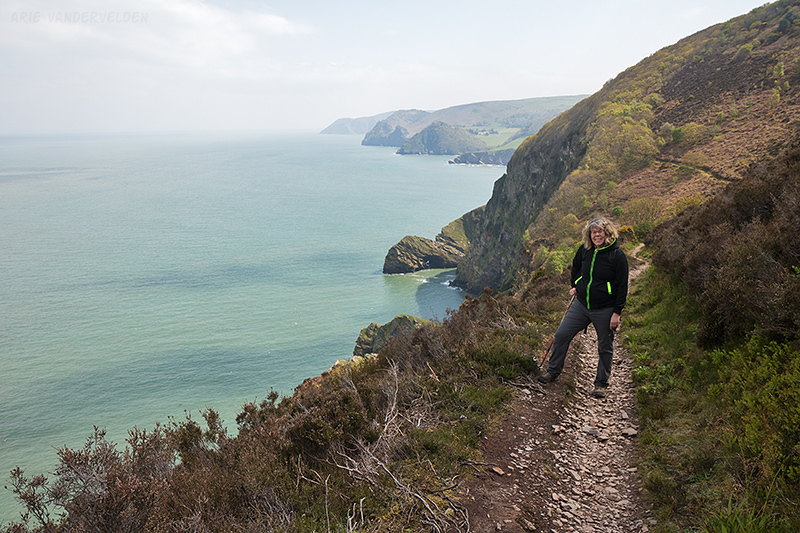 Trail between Lynton and Combe Martin. Around the next corner was a deep valley, and the trail descended all the way to the bottom, almost to sea level. 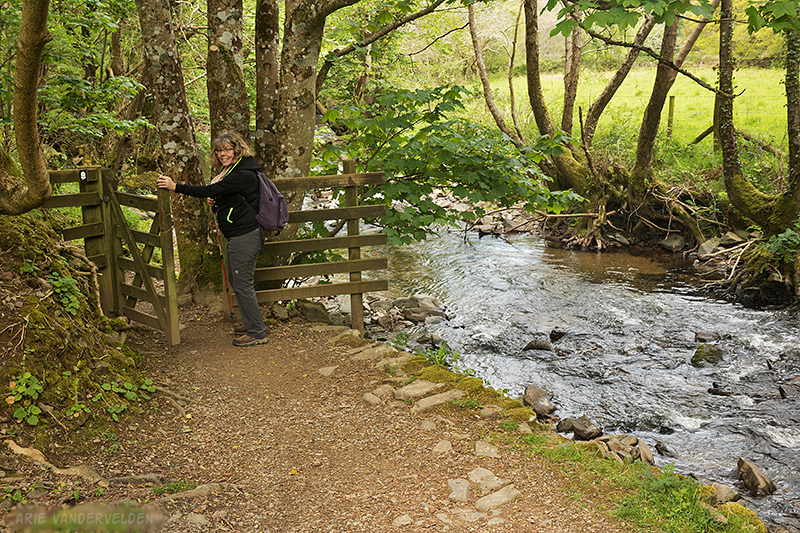 Here, we crossed the River Heddon, just a small creek really. The valley was quite lush and pretty, and it was filled with birdsong. But, of course, we had to climb all the way back out to the top. 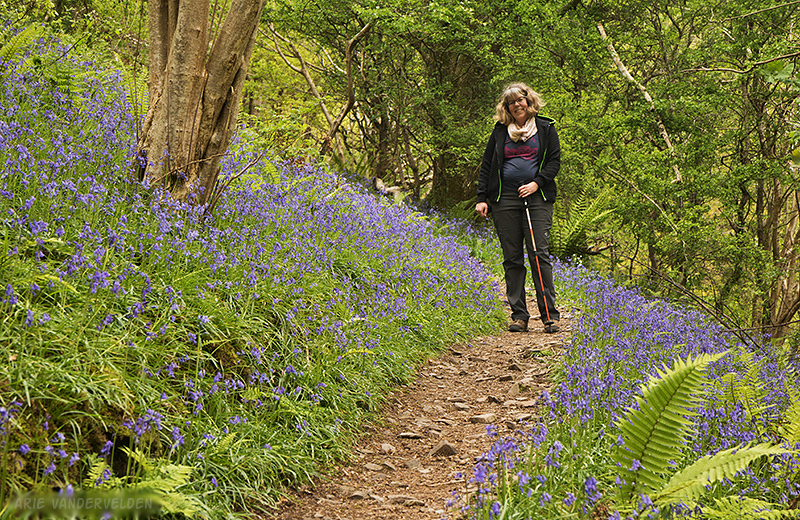 Along these slopes the forest floor was covered with bluebells. 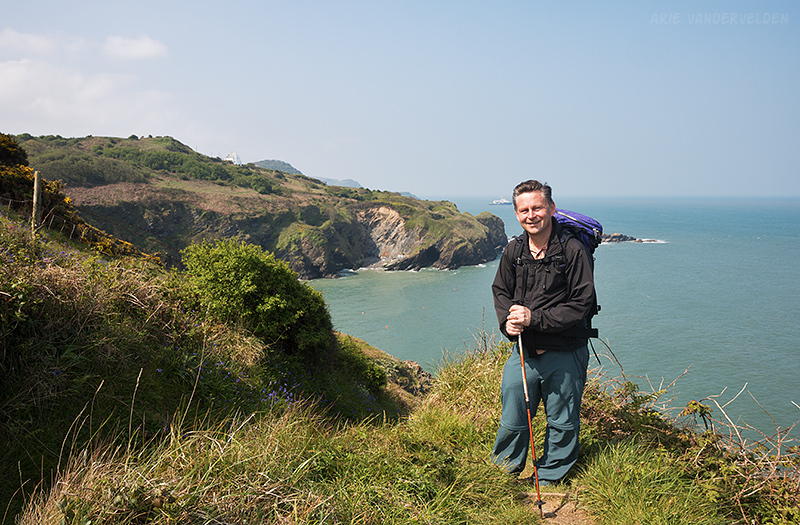 The trail climbed out of the valley and back onto seaward-facing slopes. The trail continued on, mile after mile. 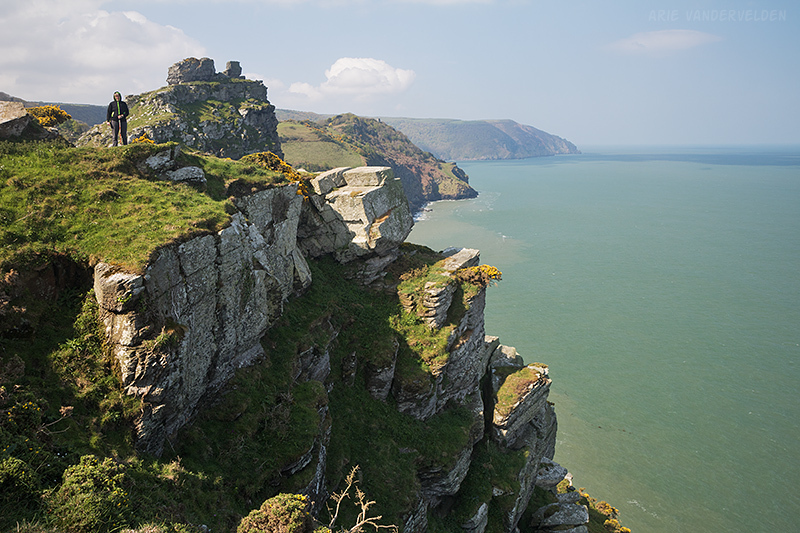 Dark, sombre cliffs were topped by moorland that was almost black in color. By now, dark clouds had rolled in. I’m sure this area must be very pretty in late August and September when the heather is in full bloom. However in early May this area was quite bleak. We plodded on. And on. Are we there yet? Not quite. The hills Great Hangman and Little Hangman are visible in the distance. The trail descended into Sherrycombe. The climb on the other side led up to the summit of a hill called the Great Hangman. 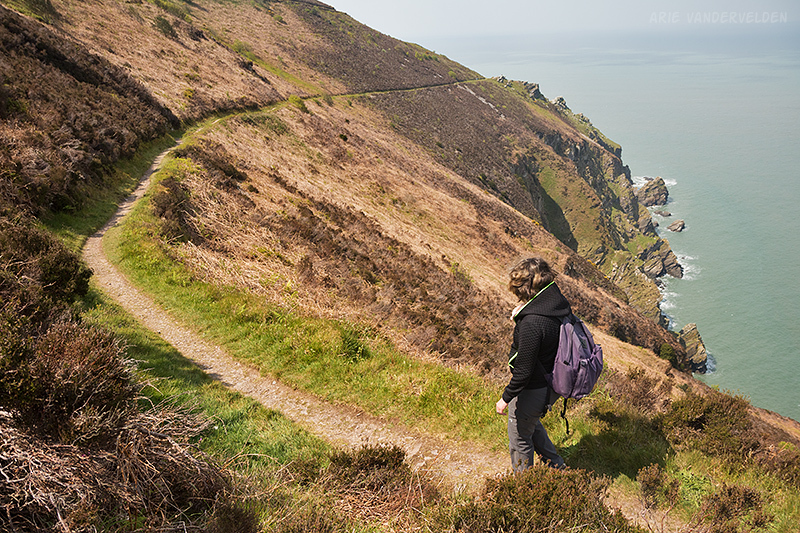 At 1043 feet of elevation it’s the highest point along the southwest coast path. From here we could see our destination of Combe Martin in the distance. We descended to a hill called Little Hangman, and from here the trail went down into the townsite where we found our B&B. The B&B owner was barking at us, telling us to sit down and drink tea, but we excused ourselves and retreated to our room where we had a hot shower. Combe Martin has a bit of a strange vibe to it. 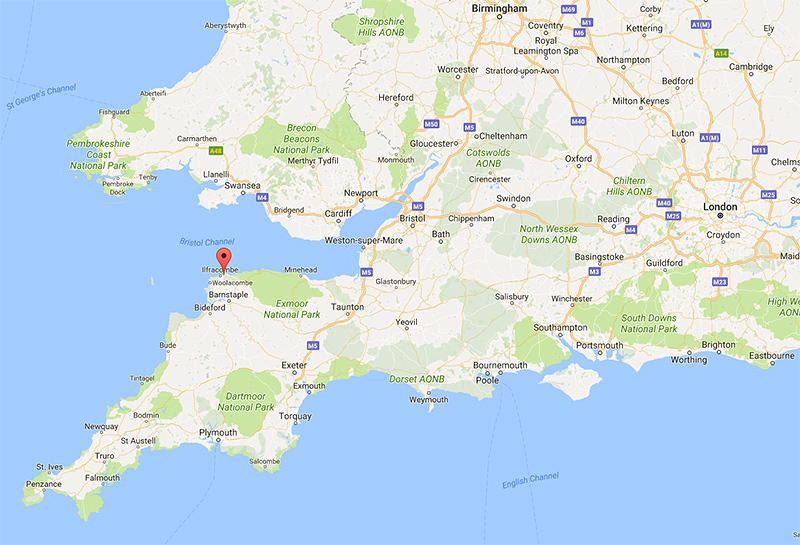 This is something the locals in Ilfracombe confirmed the next day. Only one pub was open in Combe Martin, and they had fish and chips. So, fish and chips it was. With a well-deserved pint of course. After dinner we caught the sunset at the waterfront. 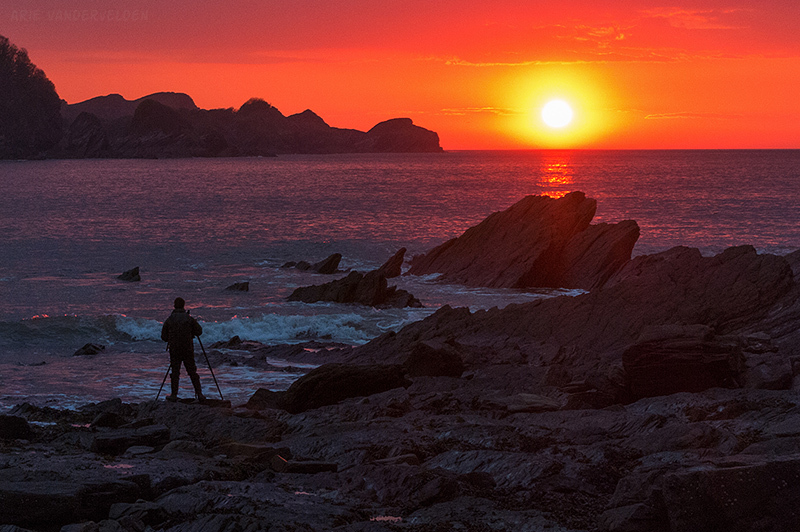 Getting the shot: Sunset at Combe Martin. 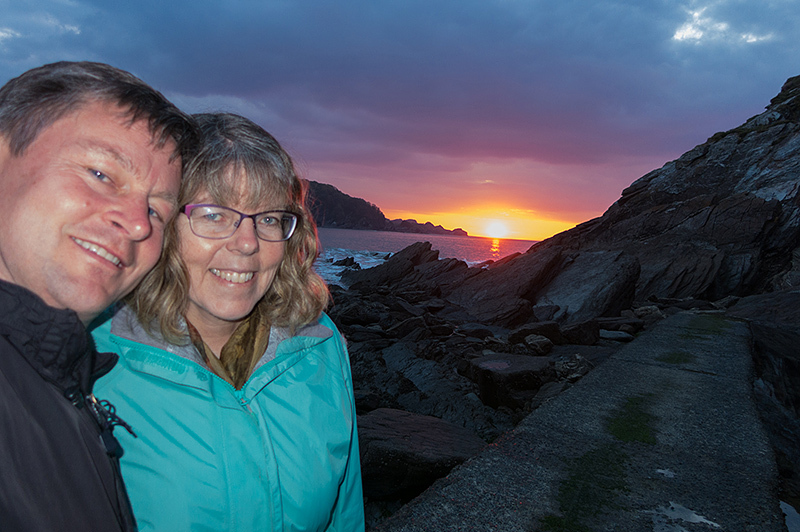 One final selfie at the end of a long but wonderful day of hiking. After a long and tiring day of hiking the day before, we were glad to have a shorter day. Our destination was only about 6 miles away (10 km). After a foul breakfast at our B&B we set off on the trail. The first bit of trail wasn’t particularly exciting. It skirted some big campgrounds, roads, and a castle theme park at Watermouth. But just beyond this bit things quickly got better. 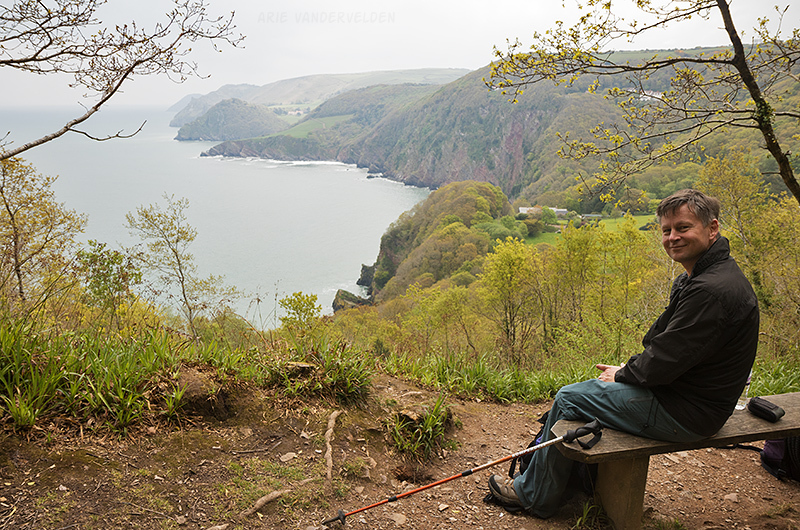 The trail went out onto a headland, and from here we had a nice view back to Watermouth Harbour. 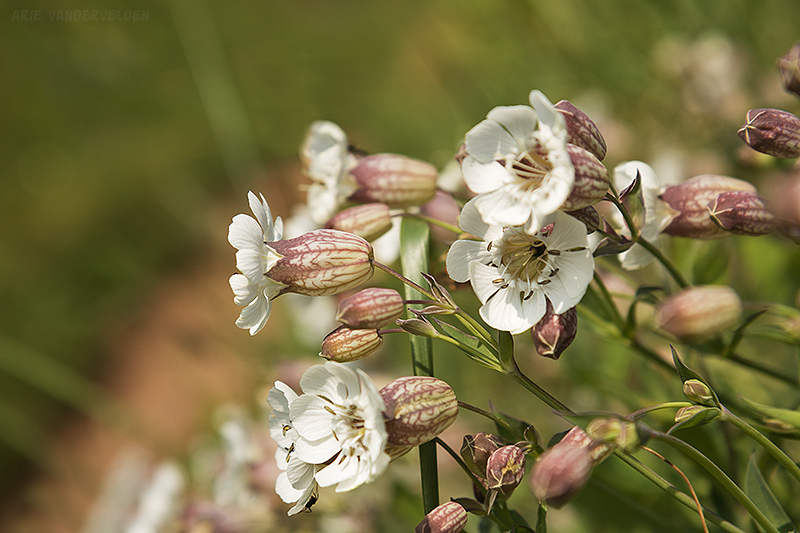 There were some nice flowers beside the trail. I don’t know what these are called. Across the hill we had views towards the next headland. A sunny and breezy day. At the next headland we sat on a bench overlooking the sea. 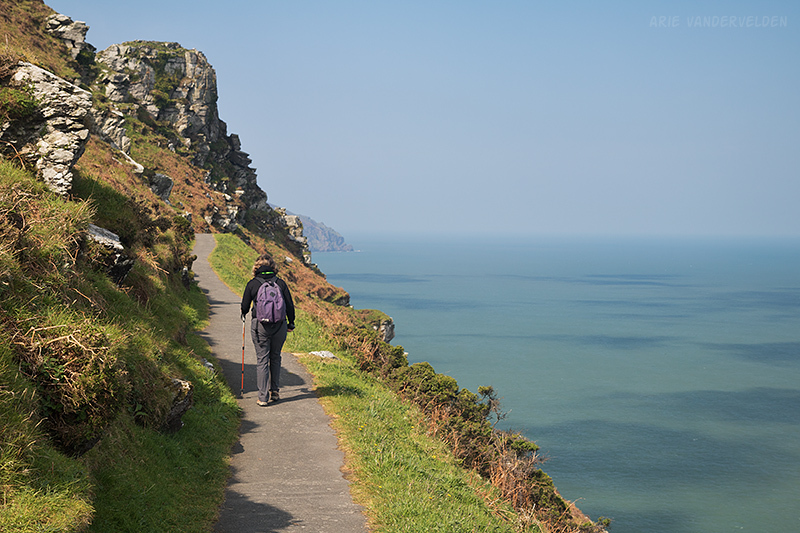 We lingered for a while, and chatted with Brits out for a walk. 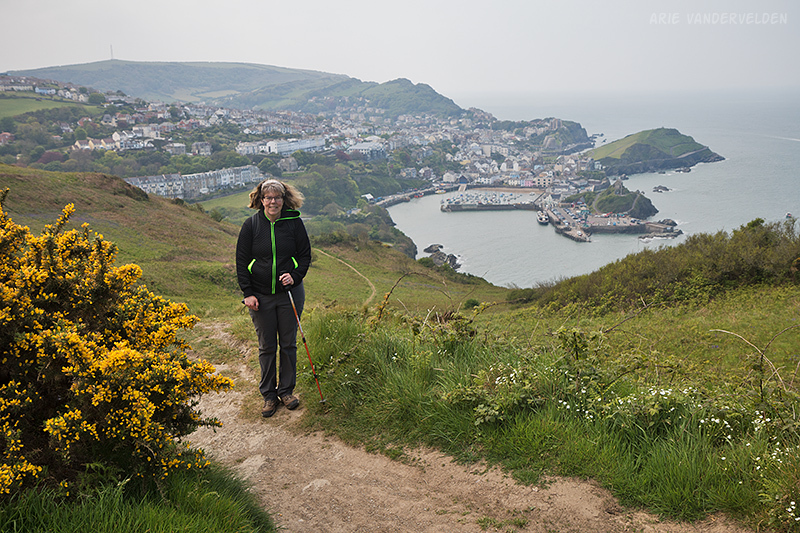 We descended to Hele Bay, on the outskirts of Ilfracombe, and then climbed the hill between it and town. From the top we got a nice view of Ilfracombe harbour. We wandered down the grassy slopes toward town. At the inner harbour we found a bakery and bought two Cornish pasties. 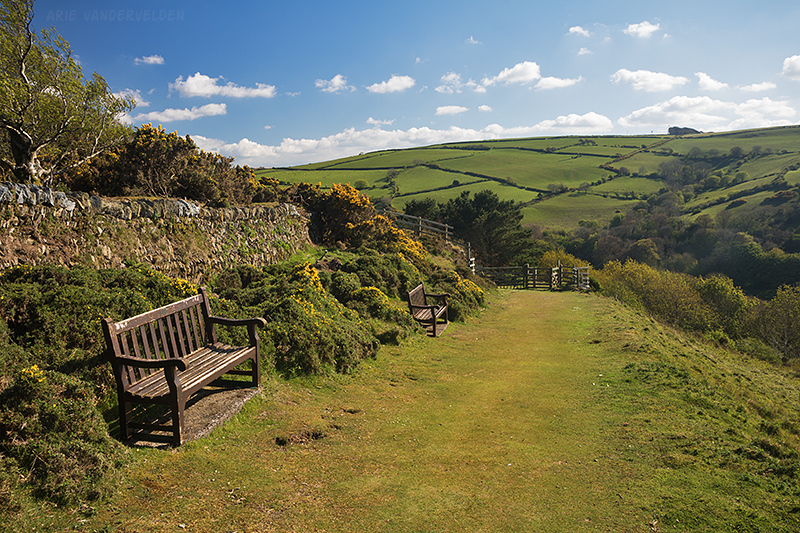 We found a bench sheltered from the wind, the sun was shining in our faces, and all was good. 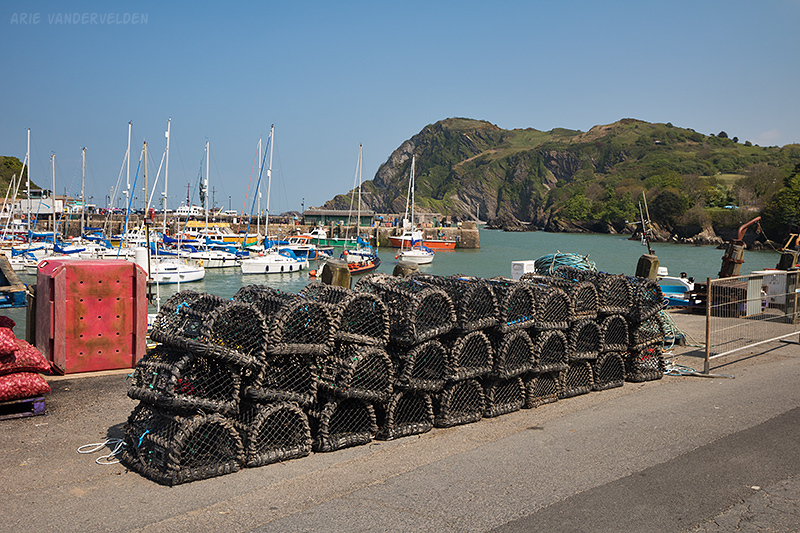 Ilfracombe became a popular beach resort in Victorian times, and its beautiful architecture reflects the prosperity of that age. It experienced a second surge in tourism in the 1950s, after the war. This boom brought with it a demand for labour, and workers were recruited in northern English factory towns such as Liverpool, Manchester, Sheffield, and Leeds. This boom crashed in the 1960s when holidaymakers started going abroad on cheap package holidays, and when the rail line to Ilfracombe shut down. Unemployment and social problems ensued. Some people warned us that even the high street was quite sketchy, but we didn’t encounter anything like that. 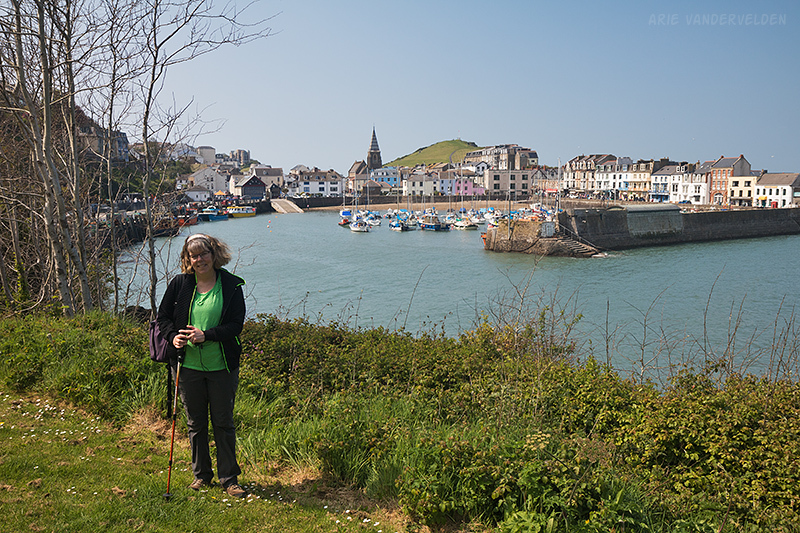 We found Ilfracombe to be a very artsy town. Yes it’s a bit rough around the edges, but the people were very friendly. We had booked a room in the Darnley Hotel, which was quite cheap and seemed too good to be true. We were a bit worried about it, but it turned out to be an excellent pick. The hotel is set in a huge Victorian mansion, built by a doctor, and is surrounded by extensive gardens. Owners Paul and Lorinda are very friendly. They had just bought the hotel, and are trying to turn it around. We had a spacious, stylish room with a peekaboo view of the sea. We were glad that we booked two nights at this place. In Ilfracombe we visited “tunnel beach”, which is accessed though a tunnel that was blasted out in Victorian times (somewhat interesting, but a tourist trap). We climbed up to the chapel above the harbour and spoke at length to the gentleman in the gift shop, who proceeded to tell us his life’s story as an expat in the Middle East and how he was once held hostage in a plane in Iran. We visited a local curry house for some tasty food. We also went on an art walk. For the art walk, I enjoyed peeking in people’s houses and chatting with the locals just as much as seeing the art on display. Continue on to part three of our hike.